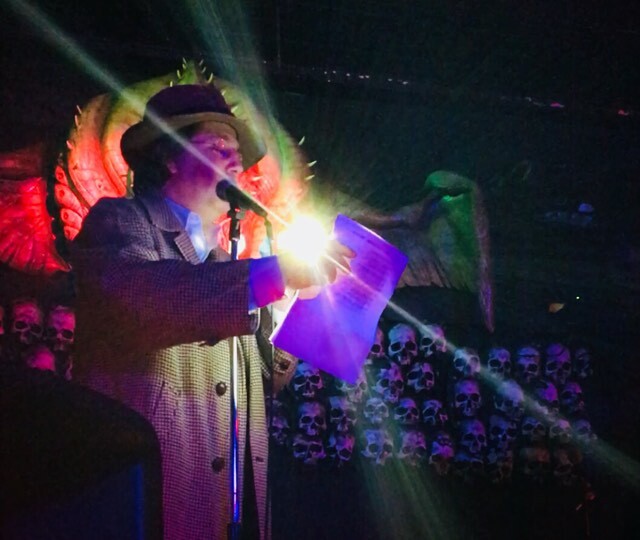 (Photo by Rob Matheny) Adam Bolivar is a Romantic poet, specializing in the composition of metered and rhymed balladry, a traditional poetic form that taps into haunted undercurrents of folklore to produce spectral effects seldom found in other forms of writing. His poetry has appeared on the pages of such publications as Black Wings of Cthulhu (PS Publishing), Spectral Realms (Hippocampus Press) and The Audient Void, and his fiction has featured in anthologies published by Chaosium and Eraserhead Press. A poem of his, The Rime of the Eldritch Mariner, won a Rhysling Award for long-form poetry. His collection of spectral ballads and weird Jack tales, The Lay of Old Hex, was published by Hippocampus Press, and was a finalist for the Bram Stoker Award. In addition, Adam is a marionettist, and has written and performed in nine original marionette plays performed by puppet troupes in Boston, Berkeley and Portland. His current troupe, the Jackanapes Marionette Guignol, has been known to perform in the Portland area and elsewhere. A native of gambrel-roofed Boston, Massachusetts, Adam Bolivar currently resides in the gloomy green dreamlands of Portland, Oregon with his beloved wife and golden-haired son.